Offering a realistic profile and an incredible level of detail, the Reaction Innovations Shiver Shot is ideal for drop shotting. 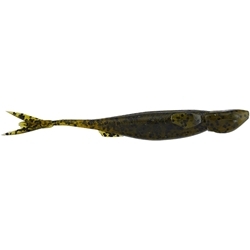 Featuring a highly detailed baitfish body shape with lifelike fins. It also features a forked tail that comes to life with the slightest movement or current. It also has a thin ridge in the center of the forked tail, which acts like a rudder and helps the Shiver Shot track correctly in current. Not only is it an excellent choice for drop shotting, the Shiver Shot’s combination of features also makes it a great choice for a vibrating jig, spinnerbait, and scrounger jig as well. Available in a wide range of Reaction Innovations’ unmatched custom color schemes, the Shiver Shot is sure to be your new favorite finesse bait.